I had the pleasure of interviewing Liz Berry and M.J. Rose, co-founders of 1001DarkNights.com They both have powerful backgrounds in marketing — Liz on the retail side, M.J. on the ad agency side. In addition, M.J. is a bestselling author.and owner of the marketing company AuthorBuzz.com and Liz is the Executive Director of International Thriller Writers and on the Education Committee of the Smithsonian Libraries Advisory Board. They are leaders in their field because of their unusual approach to publishing. Their goal was to take every rule about publishing – book pricing, marketing books and how authors were treated – and see if they could rebuild the paradigm from the bottom up with their first and foremost goal being building relationships. Authors with readers and authors with each other. Strong women helping strong women. Throwing out the idea of jealously and competition within a business arena. Seeing if – through cross marketing and relationships – they could build a company that authors would bring their best to. And one that readers would enjoy. M.J. Rose was the creative director of a large NYC ad agency when she left to become a published author. Once immersed in the publishing arena she realized that many authors weren’t using some pretty easy tools and marketing concepts to build their careers. She began teaching authors how to do their own marketing which lead to the formation of her own ad agency in 2005, AuthorBuzz.com. In addition, she kept writing. She’s now a New York Times bestselling author in her own right with more than 18 novels and 2 books on marketing for authors in print. 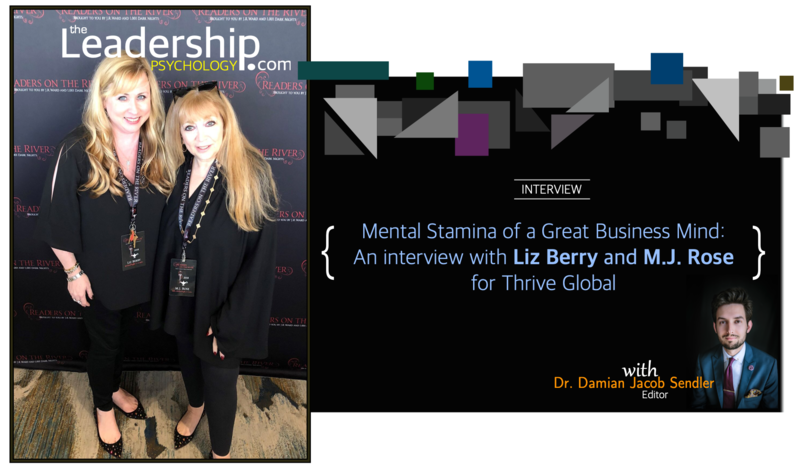 Liz Berry has a Bachelor of Business Administration from the University of Georgia and also studied international marketing at the University of Innsbruck in Austria. Both areas of study have allowed her to gain twenty-plus years of experience in the ever-changing marketing field. She utilized that knowledge for both her role as Executive Director of International Thriller Writers and co-creator of 1001 Dark Nights. She proudly serves on the Education Committee for the Smithsonian Libraries Advisory Board, and, with her husband, novelist Steve Berry, operates History Matters, a non-profit foundation that has raised over one million dollars for historic preservation. M.J. — I’m an introvert who learned how to be an extrovert in business. I think that the mix enables me to be quiet and notice how relationships are playing out within our business as well as note market trends and at the same time go into a meeting or make a pitch with a very high level of excitement. Also, being an introvert gives me a lot more time to work. Liz – I’m an extrovert who quickly learned the phrase “contained enthusiasm” when dealing with writers, many of whom are introverts. Choosing my words of affirmation wisely, and knowing when to let silence speak louder than words. I’ve also honed my skills in strength management using my extrovert tendencies — asking questions and listening closely to the answers in order in incorporate the true heart of the author or staff member into the execution of our various projects. This allows me to praise often and truly sharpen skill sets. M.J. — It means making sacrifices about your time and not being greedy about profit. We make less than other publishers on a book-by-book basis because we are always investing more and more into the company. Liz – It also means “silencing the noise”. There are always new ideas popping up, new pressures to compete on every single stage in the business, and new stress about not being good enough. The key is to remember how we got to where we are – by planning our work and working our plan. Not copying others, but innovating on our own. That’s how we became successful and that’s how we’ll remain successful. A lot of people in the business world feel as if talking about mental health makes them appear weak. How do you feel about showing mental strength and setting an example of what it takes to have the strong mental stamina to succeed? We work with authors every day who are sensitive souls – putting their emotions on the page for the entertainment of readers. That’s a vulnerable place to be, and one that we respect and admire. We aren’t afraid to show our weaknesses, nor are we shy about sharing our strengths. We have to be empathetic and can’t shy away from dealing with our author’s needs. By doing that, we form a synergy – a sense of balance – that allows them to feel valued and safe in the bubble we’ve created. M.J. – My mother always told me “this too shall pass” and it has enabled me to tackle setbacks and failures with some amount of stamina. Liz – The most impactful book I’ve ever read in dealing with my thinking and outlook on life is How To Win Friends And Influence People by Dale Carnegie. I actually read it before starting my junior year of high school – at the recommendation of a teacher – and it literally changed how I perceived the world and my place in it. I’m so very grateful for Mr. Carnegie and his words of inspiration. Don’t try to always be on. You need down time too. Take a few minutes each day to be quiet, to just be. You need to refuel in order to come up with new ideas and new methods of dealing with problems. Don’t worry. Worry is paying on an insurance policy that isn’t yet due. Anticipating problems is exhausting. Wait until it’s really a problem, then deal with it. Eat well. Not necessarily dieting – but healthy eating that keeps you alert and gives you physical stamina which goes hand in hand with mental stamina. Don’t act on every reaction. We have lots of emotions. Learn how to sit with them before taking action. We need to let feelings marinate and reflect on them before we can understand what we are really feeling – it’s not always what we think. This enables you to be secure when you do decide how to deal with what is going on. Don’t be afraid to ask for help – be it professional or from a friend or family member. We’re not superwomen – we’re just human. Accepting our frailties is important for our mental state of mind.